Provide online ordering as a service to local businesses under your brand. 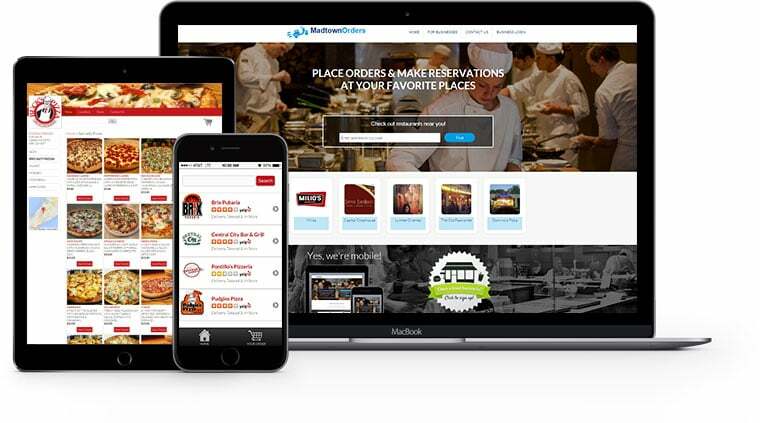 Your own multi-site restaurant ordering platform that allows users to search for restaurants near them by using their location. Connect our online ordering platform directly to a restaurant or retailer’s existing website and Facebook fan page. Having an online ordering system is becoming more and more necessary for restaurants to stay competitive. However, it can be difficult and time-consuming to develop one, which is why there are still countless restaurants that don’t offer online ordering at all. That’s where you come in. By signing up with OrdersIn, you’ll have an expansive toolkit which will allow you to sell online ordering services to local restaurants. You’ll find new business opportunities every day. You'll be your own boss, helping your community in the process. We’ll build a fully-functional marketing website for you under your own unique brand (the OrdersIn brand will not appear anywhere) and domain, which will display your products, pricing, and feature real-time interactive product demos. The businesses receive orders through the website that you set up with our robust toolkit. You can easily manage your clients, and you can also give them accounts if they prefer to manage the sites themselves. You get to choose your monetization method. You can charge a percentage of every online order, or go with a flat monthly fee. It's your business and your choice! We provide you with everything you and your clients need to be successful. Some licensees are able to make $10,000/mo of recurring income. Although, income potential is dependent on level of effort, you are provided an unlimited number of merchant accounts so there is no cap on income potential. Your customers include everyone from Restaurants (including coffee Shops, ice cream shops, bakeries), Retailers (pharmacies, cleaners, hair salons, spas, clothing stores), Service Businesses (plumbers, electricians, cleaning services, locksmiths, gardeners) and Professionals (doctors, attorneys, accountants, tax preparers). Compared to a brick and mortar businesses, which can cost hundreds of thousands of dollars just to get started, OrdersIn only charges a flat monthly licensing fee. This allows you to have a very high profit margin with little expense. From your Admin Panel you can control everything from plans and pricing, how you get paid to managing your merchant accounts. Everything from help with the platform, to ongoing best practices and marketing training, our technical and sales support team are here to ensure your business’s success. With our turnkey platform, we take care of all the details such as uptime, maintenance, security, and support, so you can focus on your business. 60% of customers have used online ordering within the past year from food to retail products. 80% of small to medium sized businesses do not have online ordering. The average merchant check goes up 35% through online ordering vs. phone ordering. Increase in order accuracy for the merchant using online vs. phone orders. Keeps employees focused on customers in the restaurant vs. time on the phone taking orders. Most businesses can not afford to custom build their own online ordering websites and apps. Let us know how to contact you and we will get back with you. We strive to give our customers the tools necessary to start your own business at an affordable rate. After that, it’s all up to you to be successful. We cannot "knock on the doors” for you or teach you to be persistent. But we know that’s what it takes! It’s all up to you to be successful after you get into business with one of our unique opportunities! Get started today! © 2018 BizOppZone.com. All Rights Reserved.